Wei-Chang Yang of NIST and the University of Maryland NanoCenter, along with Henri Lezec and Renu Sharma and other collaborators, describe their work in the April 15 Nature Materials. The scientists relied on deposits of solid carbon deposits—-one of the products of the carbon monoxide reaction they studied—-as markers for the exact locations on the gold nanoparticles where the reaction took place. The team found that the reaction concentrated at the intersection where the carbon monoxide gas molecules preferentially adhere to the gold nanoparticles and where the amplitude of the electric field associated with the LSPs was highest. Although many LSPs can be excited with sunlight, the team chose an electron beam to trigger the oscillations and studied the carbon monoxide reaction in a scanning transmission electron microscope that can operate in a room-temperature environment. 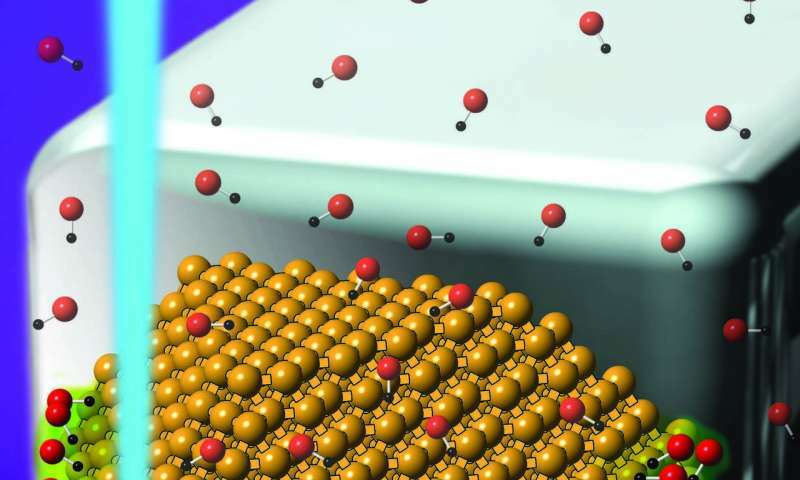 The findings, says Sharma, lay the foundation for searching for other systems that directly harness sunlight to generate LSPs in nanoparticles to drive room-temperature chemical reactions. By reducing energy consumption, such systems could have an enormous impact on industry and the environment. Vanadium, the core element here, is as abundant as copper or zinc, per Wikipedia on Vanadium. Prices are $15/kg, about half that of cobalt. About 20 different minerals contain it, and those minerals are in many countries, incl. South Africa, NW China (Gobi desert area), Mexico, Russia, and anywhere uranium is mined. So, it's not rare, and thus this is a realistic material to use as a substitute for cobalt compounds.